G-PF3147 is the little twin brother of G-L30. Together they count for round 5% of the European G-PF3147 counts for about 0,5%. The two groups split round 16.800 years ago in the Fertile Crescent where these G men developed the Neolithic agrarian culture. 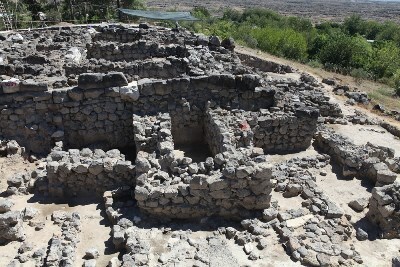 The oldest archaelogic find of G-PF3147 (as PF3259) comes from Tepecik-Çiftlik, Cappadocia, Central Anatolia, between 10.300 and 7,800 calibrated (cal) YBP. In the Big Spread caused by an abrupt climate change about 8000 years ago they left the region in mixed G groups. G-L30 and a part of G-PF3147 went to west Anatolia and then further to Central Europe through the Balkans and to Western Europe. They brought with them the Early Neolithic culture where it is found with a number of consecutive cultures, Linearbandkeramik (LBK), flourishing about 7500-6500 ago in Germany and Italy, the Rössen Culture (RSC) flourishing about 6,400-6250 years ago, Bell Beaker culture (D: Glockenbecher-Kultur) flourishing in Europe and England from between 4850 and 4140 YBP. An other part went along the coast of the Mediterranean to Greece, Italy Southern France and to Spain and brought there the Cardial Impressive Culture. Other groups went eastwards to Iran, Azerbaijan and the Indus into Pakistan. G-PF3147* is still found in Turkey, Greece, Britain, Germany and Bahrain and in LBK Neolithic sites in Germany and in Spain. 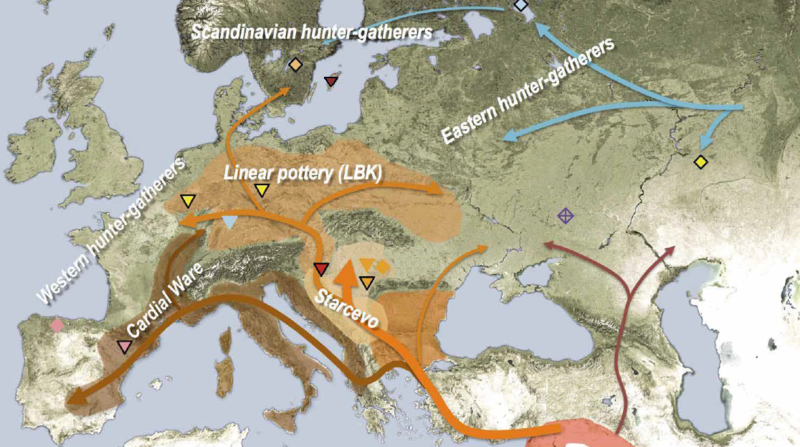 G remained the most common group in Central Europe till the Bronze Age around 5200 ybp, when we find Ötzi and the many G2a's from Treilles in Aveyron, in Southern France. 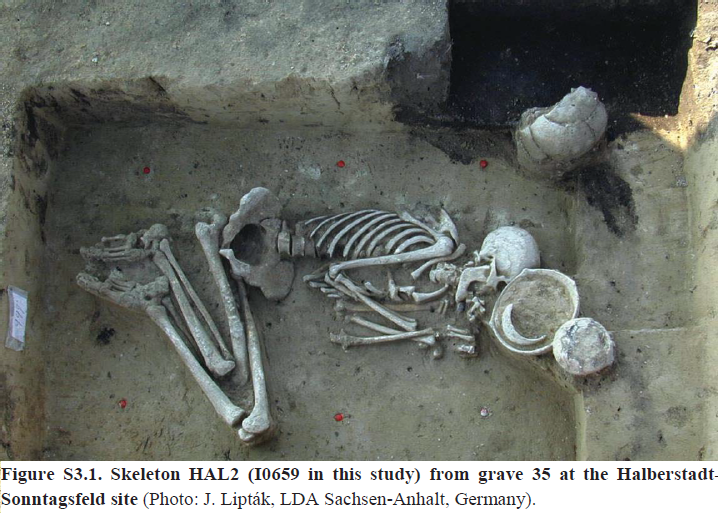 G2a2a1-PF3170 and negative for subgroups is found in an ancient skeleton dated about 7000 years old, in a man buried in Halberstadt, Germany. In an early medieval grave in Ergoldingen in Bavaria (Germany), dated round 670 AD, six men were buried together. Apparent from the dual DYS19 value was definitely at least one of them G2a2a-PF3147. They were buried with their swords, spears, and shields, so they were probably knights. Possible Migrations of G2a2a and G2a2b. Diffusion of farming through Europa. The Hesbaye is the round area beneath Holland, tinted in the color of 5800 - 5300 years BCE. The age of this group is 16,000 years old. The age of this group is estimated to be 11,500 years old. and in England. TMRCA English is 400 years bp. This branch is formed around 7,800 before present out of FGC6669. in the Northern Caucasus in Russia. 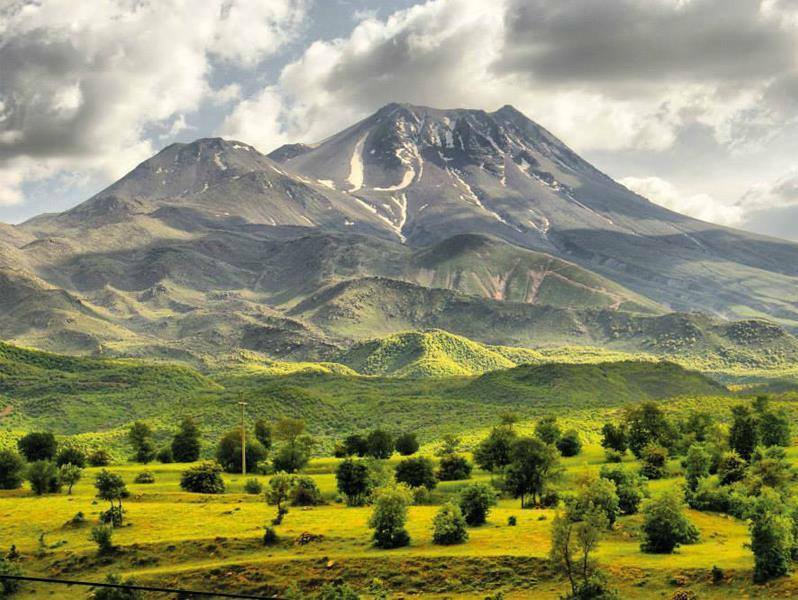 In this region live also many Armenians. Formed around 7,800 before present. Around 7,800 BP G-Y14935 divides into two branches. 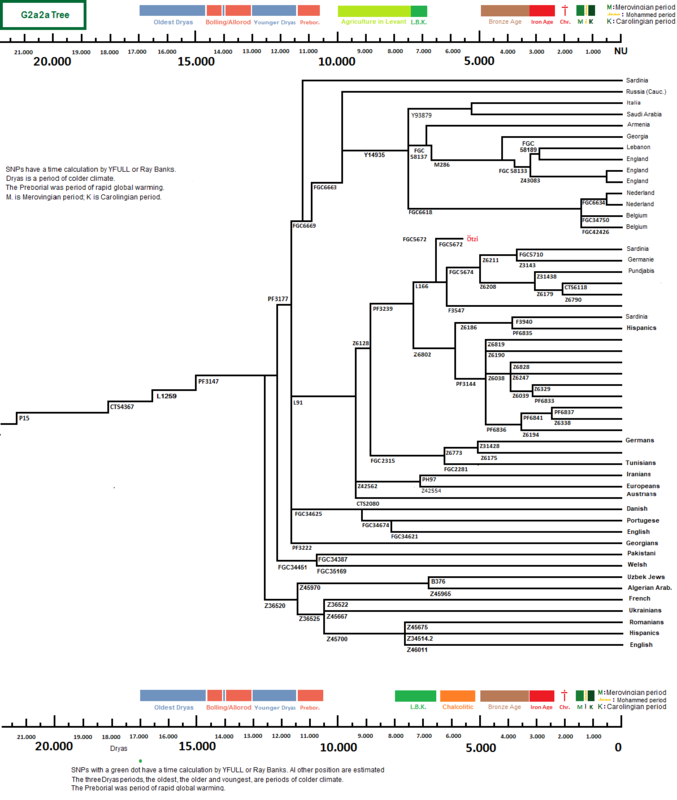 This clade arose about 11,000 years ago. In Greece archaelogic finds are in Kleitos dated 6,100 ybp and in Bulgaria 4,759 ybp. He divides into three subgroups: a - b - c.
Now in Germany, Sardinia, Tunisia, France, Georgia. 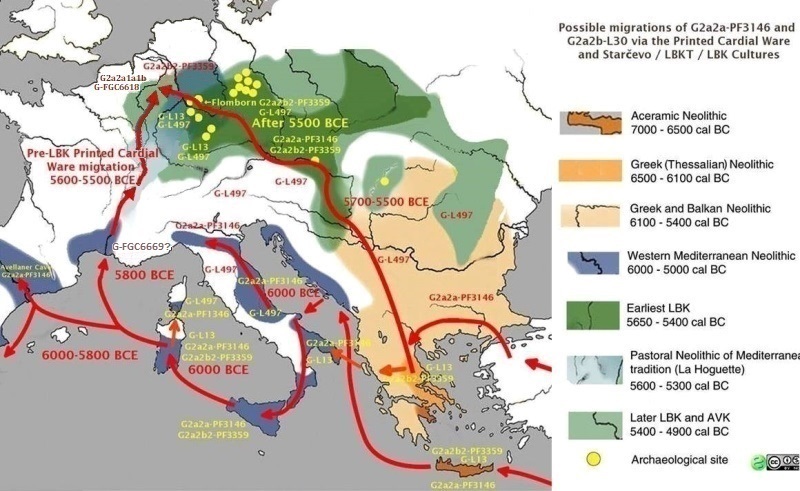 Formed 7.000 ybp, brought Europe probably the Bell Beaker culture. Now in Bulgaria, Germany, Greece , on Sicily, Sardinia and Corsica. and in the Pundjab of Pakistan. Punjabis (descendants of soldiers of Alexandros the Great of Macedonia?) with a TMRCA 5000 ybp.